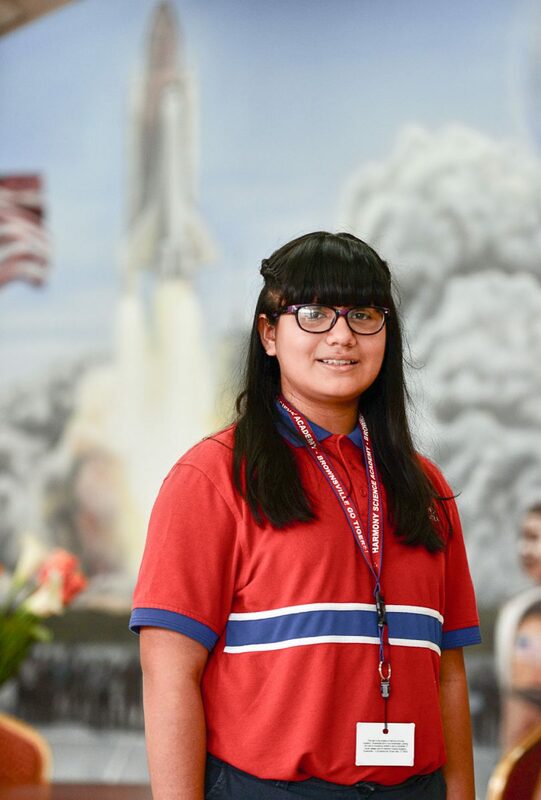 Melanie Mascorro of HarmonyScienceAcademy in Brownsville is touring the White House and the U.S. Capitol today after doing her school and her city proud in the Scripps National Spelling Bee in WashingtonD.C. Melanie Mascorro of Harmony Science Academy in Brownsville is touring the White House and the U.S. Capitol today after doing her school and her city proud in the Scripps National Spelling Bee in Washington D.C.
Melanie, a sixth-grader, represented the Rio Grande Valley in the annual national spelling contest after winning the Rio Grande Regional Spelling Bee in March. During the third round of the national bee, she listened carefully to the pronunciation of “lobscouse,” a sailor’s dish made of stewed or baked meat and vegetables, then correctly spelled the word. Melanie said she didn’t ask many questions because she didn’t have to. Contestants are allowed to ask to have their word pronounced and used in a sentence, but Melanie said she knew the word. Melanie exited the event during the fourth round on the word “deferral,” meaning the act of postponement. Gonzalez said Melanie represented Harmony, Brownsville and the Mexican-American community well at the national level. She added that Melanie has two years of eligibility left and hopes to return next year. Meanwhile, Melanie enjoyed some of the fruits of her labors by visiting the Lincoln Memorial and Washington Monument on Thursday. Today, she is scheduled to tour the White House and the U.S. Capitol. U.S. Rep. Filemon Vela, D-Brownsville, arranged both visits. Melanie’s trip to Washington, D.C was sponsored by AIM Media Texas, which sponsors the regional bee and owns The Brownsville Herald, The Monitor in McAllen and Valley Morning Star in Harlingen. Gonzalez, mother Perla Rocha-Villarreal and brother Miguel Mascorro accompanied her on the trip.